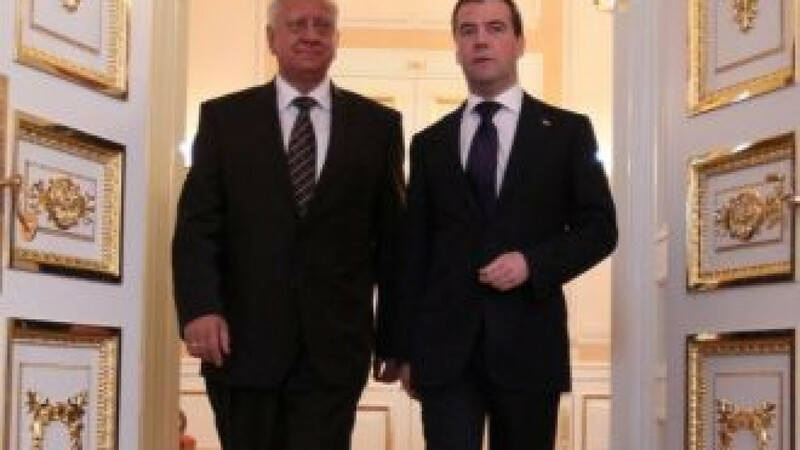 Belarussian Prime Minister Mikhail Myasnikovich, left, walking with Prime Minister Dmitry Medvedev in St. Petersburg in June. MINSK — The Belarussian government has thrown open its doors to foreign investors by lifting restrictions on the privatization of state-owned companies. Any state-owned company can be privatized, said Belarussian Prime Minister Mikhail Myasnikovich at the opening of the 7th Belarussian Investment Forum in Minsk on Friday. "Belarus needs foreign direct investment. Belarus will do everything to get it here," he said. In March 2011 the government gave a list of 244 state-owned enterprises that should be privatized by the end of 2013 and another 134 that were supposed to be transformed into joint stock companies. Friday's announcement extends the list further. About 600 guests from 30 countries are attending the forum. The biggest delegations are from the European Union, China and Russia, but also present are representatives of multinational companies and major international financial institutions. Foreign investors, including companies from the United Kingdom, Austria, Italy and Cyprus, are expected to sign 12 agreements with the Belarussian government at the forum about joint projects. Belarus already has about 6,000 foreign enterprises — most of them from Russia and former Soviet Union republics — that work on its territory. Officials hope that liberalizing privatization will tempt more private investors to take a slice of the largely state-controlled economy. Currently, up to 80 percent of the companies in Belarus belong to the state. In addition to privatization, the forum touted information technology and pharmaceuticals as the investment areas with the most potential. Investment activity in Belarus will be particularly lucrative for foreigners because it will open the doors to the bigger economies of Russia and Kazakhstan, which together with Belarus function as a common economic space, said Grigori Rapota, the Belarussian secretary of the Union State. "By developing your business in Belarus, you will have access to the markets in Russia and Kazakhstan," Rapota said. Viktor Khristenko, chairman of the Eurasian Economic Commission, added that Belarus may soon start actions to become a member of the World Trade Organization, which would further increase its attractiveness to investors.